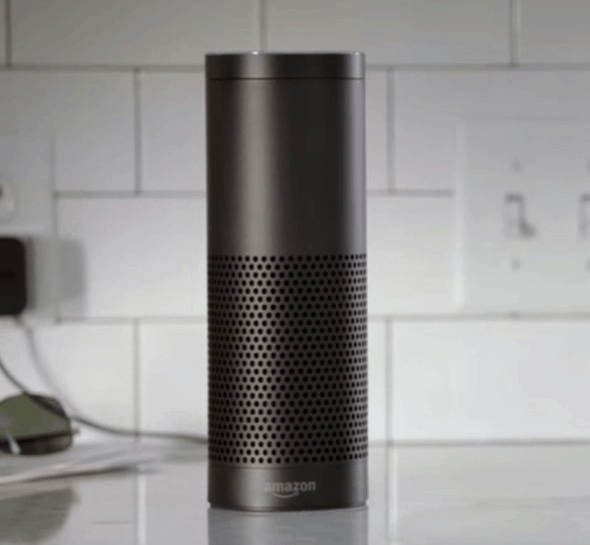 The Amazon Echo continues to get new features. Most recently, it added StubHub integration to find out what events are taking place in your area. 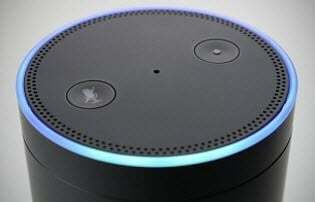 The Amazon Echo, Amazon’s voice-controlled smart speaker, continues to get new features. Most recently, it added StubHub integration that will allow you to find what events are taking place in your area or other cities. 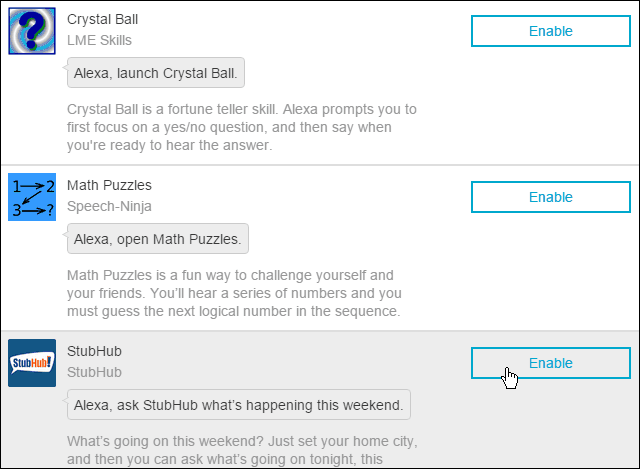 There are some other features you can add to the Amazon Echo, which is called Skills, which you might not be aware of. Here’s a look at how to add these skills to make your Echo’s digital assistant “Alexa” smarter. Launch the Echo app (available on Android, iOS, and Kindle Fire devices) or the Echo web interface. Then in the left column click on Skills. At the time of this writing, you’ll notice there are three cool features. StubHub which will tell you what events are going on in your area. Math Puzzles provides a series of numbers, and you have to guess what the next on in the sequence is. And Crystal Ball is a virtual Magic 8-ball toy that gives random answers to yes or no questions. One thing to remember is you have to make Alexa launch the app or service before using it. Keep an eye out for new features in the Skills section. As third-party developers add function to the Echo, you’ll find them here. If you don’t have one, you can pick up the Amazon Echo for $179.99. 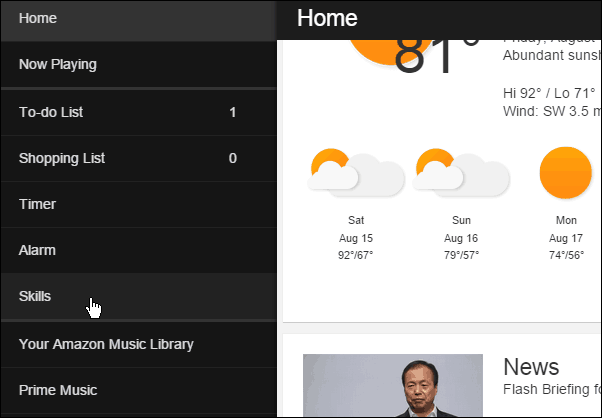 Also, make sure to check out our article on how to make the Echo smarter out-of-the-box. And we have even more! If you’re a new owner of the Echo, you might find some of the following articles of some interest in helping make Alexa smarter. Do you own an Echo? Leave us a comment below and let us know how you like it, and how you use it. I setup Stubhub, and was asked my City ,but Echo got the State wrong. How can i start over for correct city&state ? This will allow you to change it. Perfect :) I set the home city as my actual city (where Stub Hub doesn’t generally have events…) so this command allowed me to change it. I have the Echo and like it very much. However, I have yet to do more than scratch the surface of its capabilities. Would love to use the shopping list feature more extensively but found that my Stop & Shop Supermarket has limited, very limited, WIFI capabilities etc., and I’m unable to access the app (shopping list) unless standing near the front door. I look forward to integrating it more and more into my personal routine as I learn more of what it can do. So, to that extend, I find your article very informative. Is this designed by Echo Entertainment Group Ltd shs ?? If not who is the maker?